If you're in MyungDong, do yourself a favor and stop by the Red Mango cafe. They by far have the freshest and tastiest frozen yogurt. Their coffee too is at the top. I think it's of organic beans - I could be wrong about this. But they have a selection of "organic" drinks and dessert goodies. They are located on the second floor, so it's easy to miss. It's on the main strip of Myungdong, the road off exit 6. When you get off the exit 6, walk to your left and you will see a whole street of stores down the road. That's where you will find this hidden gem someone where on the middle of the strip, right around after you pass by the store Body Shop. Look up on the second floor to see signs for Red Mango. There aren't a lot of quiet places to hangout and catch your breath in Myungdong. 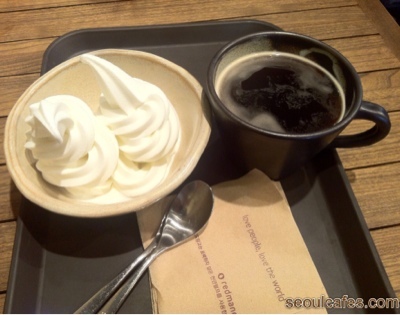 The cafes are usually of chains like StarBucks', The Coffee Bean, and Dunkin' Donuts..etc. They are usually packed and often louder than loud. This cafe has always been good to me.